The pace of rapprochement between Eritrea and Ethiopia, longtime foes who have been in deadlock for the last 20 years, changes quickly. It is hard to keep up. 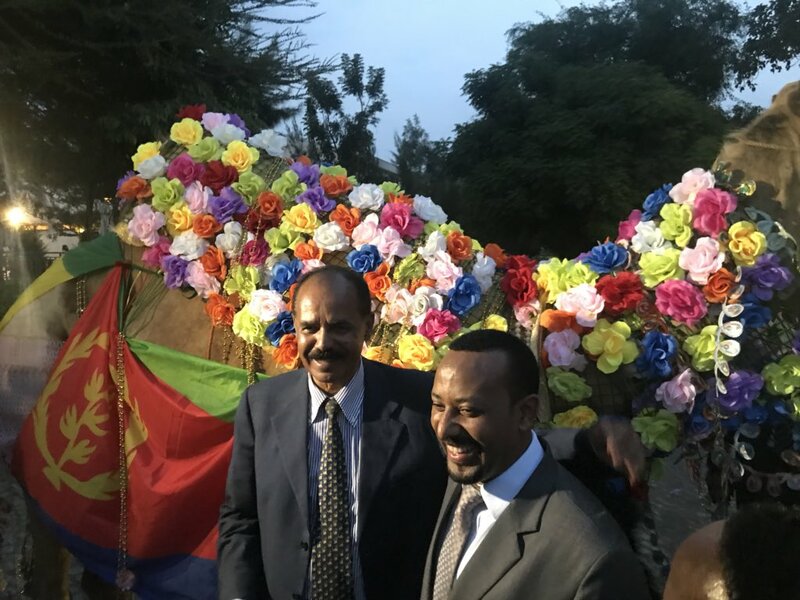 Eritrean President Isaias Afwerki and Ethiopian Prime Minister Abiy Ahmed in Hawassa, Ethiopia. Image: Fitsem Arega, Chief of Staff, Prime Minister Office, Ethiopia. By the time this is published, it could be old news. To recap: On June 5th, Ethiopia declared it was fully implementing the Algiers Peace Treaty signed between the two countries in 2000. This was followed by a long silence on the Eritrean side. Then, suddenly, two weeks later, Eritrea not only accepted the peace offer, but took a step further and sent a delegation to Ethiopia. Shortly after, Ethiopia’s prime minister visited Eritrea. The two leaders signed a joint Declaration of Peace; telephone service between the two countries immediately resumed after 20 years; Ethiopian Airlines will start regular flights to Asmara (a direct flight between the two countries would take an hour; it currently can take up to a day); and roads are about to be opened between the two countries, etcetera. On 14 July, Eritrea’s president Isaias Afwerki visited Ethiopia for three days. The Eritrean embassy in Addis Ababa is expected to be re-opened during Afwerki’s visit in Ethiopia. It has been a long time since Eritrea received any positive international coverage. At best, the country fed off visits by Eritrean-American celebrities in search of “home” or who represent aspects of Eritrean culture at public events. Like the the comedian Tiffany Haddish (her late father is Eritrean) stole the show at the Oscars when she wore an Eritrean dress. Separately, Eritrean cyclist Daniel Teklehaimanot made history in the Tour de France when he became the first African to wear the “King of the Mountains” jersey. Otherwise, the country has been inextricably linked to tragedies (most notably having the dubious distinction of exporting the most African refugees from any country, the majority to Ethiopia.). The excitement shown by Eritreans when Ethiopia’s prime minister, Abiy Ahmed, came to Asmara was close to the euphoric feelings felt during the country’s independence in 1991. Some Eritrean mothers, who composed praise songs in honor of Abiy Ahmed, named him peace “Nabi” (Arabic/Tigrinya word for prophet). Similarly, Afwerki was warmly welcomed in Ethiopia. The euphoric response to the normalization of relations has been manifested in many odd, mass pursuits in Ethiopia, including random calls to Eritrea. Tickets of the first flights between the two countries were sold out in a couple of hours. The stakes for both sides are great. Many families who have been separated for two decades will be reunited, trade is expected to resume; the landlocked Ethiopia will have access to the closest port, etcetera. Eritreans who have been held hostage for twenty years are hoping to restart living. As for Ethiopia, there euphoria is high as Abiy has undertaken a number of reforms, including releasing political prisoners. As Nanjala Nyabola argues at Al Jazeera, “Ethiopia constructed the most elaborate security state in East Africa. Millions of dollars that could have been spent on food security and development have instead been wasted on armies and surveillance, turning citizens into spies and destroying freedom of expression.” There is hope this will be done away with. Eritreans have stopped waiting for official communication or real news from their government a long time ago. Apart from public rumors, they mainly depend on reading between the lines from interviews and speeches of their president. The silence from the Eritrean officials has been long. As many Eritreans also lost trust in their leadership, large sections of the Eritrean population is genuinely worried even if Afwerki is at all ready to make improvements. The lack of official communication from the state has opened a room for over-interpreting his speeches, toxic attacks from opposition media in exile, and wider cynicism. Beyond trying to decipher officials’ body language or the self-congratulations by Eritrean and Ethiopian officials, the world is waiting for official announcements from the Eritrean government. Many are even worried how the Declaration of Peace between the two countries will apply to Eritrea. It has been years since the country has ceased to function normal. Quick intervention is essential in almost all sectors, including but not limited such as: lifting the ban on trade (placed in 2003); lifting the ban on construction (placed in 2006); abolishing of civilian army from the ages of 18-70 (placed in 2012); an immediate declaration on the standing army and an end to the indefinite military service (justified since the border was of the two countries in 1998); free all prisoners of conscience (mainly after 2001); free prisoners of faith and allow religions (placed in 2002), lift the restriction of movement within the country and outside, allow international monitoring groups to access the country, etc. Despite all the progress on the Ethiopian side, the Eritrean government has not shown any signs of improvements or commitments so far. Many Eritreans hope the country’s forced, compulsory conscription (for all young people) ends. (This system is cited as one of the main reasons Eritreans flee their country at such levels.) But in a short speech (probably the shortest in his entire tenure) Afwerki gave at the graduation ceremony of the 31st round of national service, many expected him to at least announce that this round would be the last school year to be taught at the military training center. Yet he only pronounced his departure to Ethiopia. Many Eritreans are celebrating the rapprochement hoping that there is no way to return from this. Eritrea’s reclusive policy attracted all kinds of people. Whomever volunteered to side with the tyrannical rule received the highest state media coverage and could meet with the most senior government officials. Some non-Eritrean nationals could even claim that our nationality would be revoked if we write against the state abuse. For others it is a career. Ms. Bronwyn Bruton, deputy director of think-tank group, Atlantic Council, is a case in point. (Check here to know more about the think-tank and its director Peter Pham). Back in 2015, Bruton announced that Eritrea has demobilized more than 100,000 soldiers, appointed a chairperson to draft a constitution, and restored the indefinite national service to 18 months (none of the three claims were true). On other occasions she discussed her meeting with President Isaias Afwerki and other top officials and praised their humility. Slowly this reached another level. With her “yes, but” sophomoric argument and privileged oversimplifications, she wrote that things in Eritrea are not as bad as reported from outside. She became a guest speaker at the ruling party’s seminars. Atlantic Council then organized discussion under the theme, “Rethinking Eritrea.” Eventually, she started appearing on public forums to counter anything written against Eritrea, even in the comment sections of articles). It is worth mentioning that one of the sponsors of Ms. Bruton and her organization is Nevsun Resources, a Canadian mining company operating in Eritrea whose work could be affected by the peace process. As Africa Talks reports, the Atlantic Council, has received between $100,000 and $249,000 in contributions from Nevsun Resources. Everyone was tired of the senseless war and later unjustified deadlock. No wonder many leading media outlets in the West are celebrating. The UN Security Council, for whom the Eritrean file is a priority, praised the rapprochement as “historic.” As the Horn of Africa has been a theatre of proxy wars, such normalization of relations is also expected to have a long-lasting effect in the region. Overall this is also a promising sign across the continent. Media outside Eritrea, particularly in the West, human rights organizations and websites covering the continent (including on this site, here, and here) have long portrayed Afwerki as the worst villain. They were not far off: Eritrea is a one-party state with Afwerki at the head responsible for creating all the chaos the country has undergone over the last two decades. But now they’re changing their tune: Suddenly all they can go about is Afwerki’s so-called “charisma.” Even their favorite image of Afweki has been replaced. Like here, here and here. How things will unfold is difficult to forecast in the fast-changing relations of the two countries. The answer to all questions? Of course wait and see.